The following Demo illustrates our AI staffing recommendation engine and how it can be used to identify a potential hire. Upon entering the credentials of different individuals who have applied for a position in your organization, our machine learning software is able to parse through their information, along with their LinkedIn pages to accurately assign a “Score” to each of the applicant, thus identifying whom the organization should hire for a specific role. Please note that this demo does not illustrate the entire recommendation engine, but rather just the output the user would be able to see. Since this demo contains confidential information about potential hires, please visit the link mentioned at the bottom of the page to request an access to this demo. 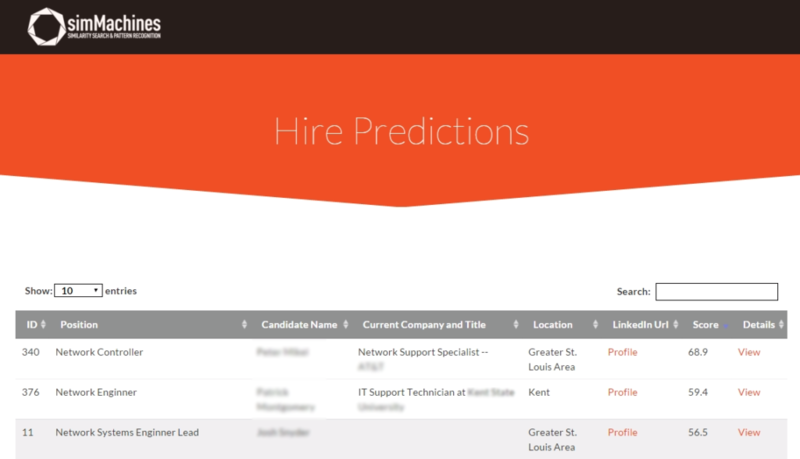 You will be greeted to a tabular view of all the results computed with the individual scores assigned to each person, thus identifying whom an organization should hire for a specific role. Upon requiring a specific filter, the user can scroll down to the bottom of the demo where specific filters can be applied to narrow down the selection process rather than manually sifting through all the applicants to identify who would be suitable for a specific position in an organization.